Following the success of Itsa Cookbook, Domini Kemp returns with a sequel based on her acclaimed column in The Irish Times. Here are 100 of Dominis favourite at-home recipes. Without mentioning the recession word, Domini subtly focuses on recipes for our times, with emphasis on midweek meals, value-added recipes, upcycling, recycling, practicality (dishes that freeze well, keep well or work within a 3-day menu) all within the range of ordinary people. 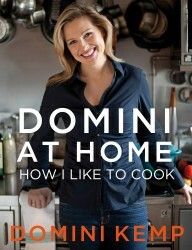 Although a very accomplished cook and business woman herself, Domini only wants fuss-free at home. Here, Domini lets us into her own kitchen to give you the inspiration to cook at home too.